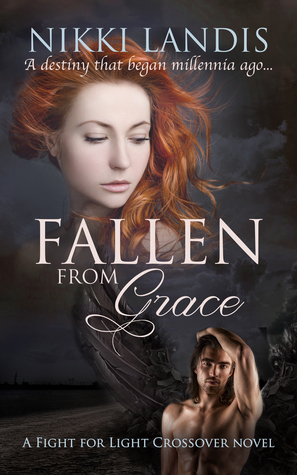 Fallen from Grace is a story about Bash and Emily. The book starts out with Emily coming to after a car wreck. She died and was saved by a dark angel that stole her heart completely in the very limited process. Jarrod, her fiancée is trying to console her that she is safe, and sound and the accident is over, but she feels like she cheated on him, when nothing really happened but that the angle with the ebony wings saved her. The next day Jarrod took Emily home and she felt silly and unwanted, so she took in the attention that Jarrod was paying her and tried to start feeling normal, as in how she felt before the accident. Emily then has a dream and finds out that Bash did still want to be with her but had to let her go back. While they are talking though, Emily feels a burning on her arm and Bash tells her he has to let her go that he has put her in danger. Then we find out how she is in danger, but I will leave that to you to find out. This story is great. The characters develop fast and draw the reader right in. The way things start it just grabs the reader and keeps you wanting to read more and not put it down. This is a great change from the normal paranormal romance. If you love paranormal romance, then you should try this story. If you are a fan of angel romances, then I would say this is a must read for you. Sign into Goodreads to see if any of your friends have read Fallen from Grace.